Xylotomous Xatu! Pokemon One a Day, Series 2! Xatu, a bird like entity with prophetic power arises for today's One a Day illustration! Who'd have thought that the tiny round Natu would sprout up into such a tall and slender creation? Accentuating it's design into a totem inspired piece, I feel this route, as expected as it might have been, was the best possible choice to highlight it's form. Mostly because, well, it does look like a living totem pole. Or is that just me? There seems to be some sort of Native American nods in design for the creature. 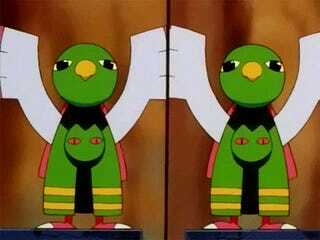 My end result is a combination of both illustrating Xatu as a totem pole if it were one physically, as well as one stylized to appear graphically as such. This came about a long process of tweaking design elements and finding what works by coming to a middle ground from both sides of what I envisioned for it. I looked at a good number of totem poles and Native American art as a whole for reference. As totems usually feature a number of animals/creatures, I had to create my own direction as this is just one creature in vertical shape. I combined many elements from several studies much like I did for Zapdos in Series 1. Basically, trial and error ensued for numerous hours of playing around with shape and representation. I settled on combining sharp and curved edges in appropriate areas to get Xatu's original shape into the fold. I focused on the body first, and then focused on the face, which I got around to last and am very happy with how that came out. As I was getting ready to publish, I thought about adding wooden grain texture to help spice it up a bit, and help with pushing the graphic design for nod to a totem pole outside of the body and wings. 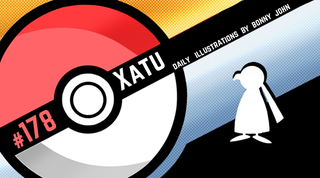 Furthermore, I played with a colour palette that felt fitting for Native American art opposed to the original saturated and expected palette for the original Xatu. The end result is a piece I'm proud to have achieved. Are there any other Native American inspired Pokemon you'd like to see in future generations? If so, what would you name it and what is it based off of? It's fun to stay the...Y M C A!